Ringtones is an interactive installation piece that generates algorithmic music based on any ten digit number dialed by a participant. Ten digits equates to ten billion unique phone numbers which means the phone is capable of creating ten billion unique pieces of music. In order to achieve this the phone's original circuitry was removed and a microcontroller was grafted into useful parts such as the keypad, hook, indicator light, and speaker. Basically, the microcontroller's program senses the state of the hook, waits for a phone number, then configures and plays the synthesis algorithm. 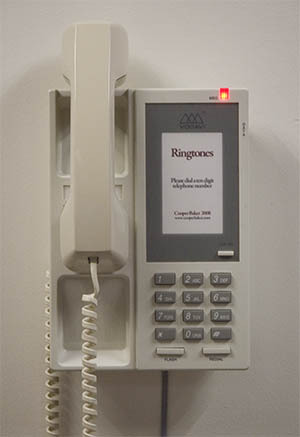 Ringtones has been exhibited at the 2008 Los Angeles Bent Festival, the 2008 Sound in Space Festival, the 2009 UCSD Spring Music Festival, the 2012 Art of Sound Show at Space4Art Gallery in San Diego, and the San Diego Art Institute Winter 2014 Invitational Show. Here is a webpage describing the 2014 winter invitational show at the San Diego Art Institute.